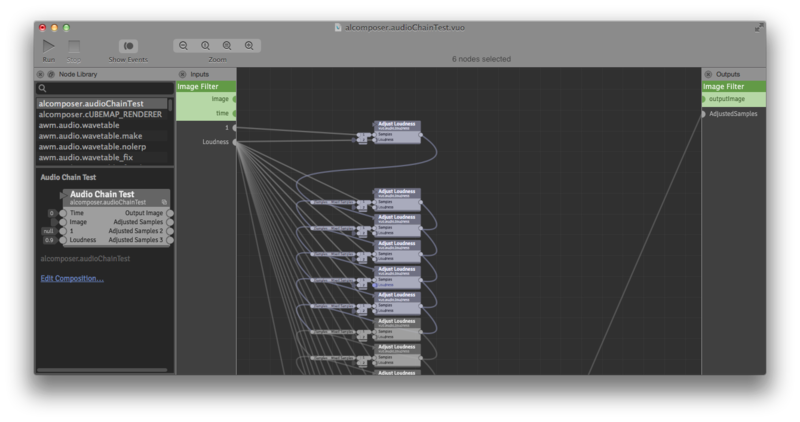 Would be fantastic to show a count of selected nodes somewhere within the editor. Great if you are needing to know how many nodes in the system- or how many nodes you have selected, for any reason. Similar to how finder shows how many items are selected. Need only be a small dialogue that is in the center of menu bar? Maybe this could allow for a feedback dialogue area? So as in other software (I am thinking of GIMP) it lets you know what you can achieve by pressing different buttons etc)? Positioning of dialogue is not important in this request, simply that it allows feedback as to how many items are selected. Could also show selection dialogue about cables if people think that is also helpful. I don't know how much help a JS, Python or Apple script would be in this exact situation, unless that data was passed to it, and then it would probably be as much work anyway. If there is interest in a scriptable or customisable editor then maybe we should FR for something more powerful than applescript or JS? So that this would be possible to code in it, with least work from team Vuo. Is there some sort of "plugin" in Qt? I am assuming that the editor is written in Qt.